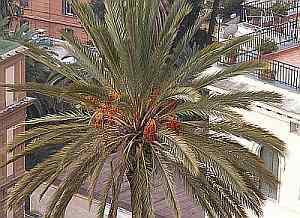 If there is an iconic tree for Naples, it is the Mediterranean Pine, the Aleppo Pine Tree (Pinus halepensis). It is on millions of postcards of Naples, and, though many of the trees have disappeared because people who build houses like to chop them down, they don't seem to be, at least for the moment, botanically threatened. Not so with the palm tree, also a symbol of Naples and of many other cities throughout the Mediterranean. An earlier item in the Miscellaneous pages light-heartedly alluded to a problem in Naples with the palm tree pest called the red palm weevil, Rhynchophorus ferrugineus (image, right), (in Italian, popularly called the punteruolo rossa). The problem is anything but light-hearted. The insect is what is called a "concealed tissue borer" and attacks young or damaged trees. A single female can lay over 500 eggs, and the hatching larvae then tunnel quickly into the trunk tissue, often escaping notice until the destruction of the tissue is in advanced stages. The insect is a strong flyer and can cover 1 km without resting, thus spreading rapidly. The red palm weevil is the greatest threat ever to the survival of the particular species of palm trees in the city (generally species of the genus Phoenix dactylifera—the date palm), hundreds of which have already had to be removed. The areas most visibly affected in Naples are the long street, via Augusto, and square, Piazzale Tecchio, both in Fuorigrotta and the large public gardens, the villa Comunale, along the seafront. At the moment, the pest seems unstoppable and, in this, Naples is sharing much the same fate as Mediterranean cities such as Valencia, Nice, Palermo and Bari. The red palm weevil is originally from tropical Asia, but has spread to Africa and Europe, reaching the Mediterranean in the 1980s. It was first recorded in Spain in 1994, in various regions of Italy in 2005 and in France in 2006. Apparently, it has also now spread to the western hemisphere, being reported in Curucao in the West Indies in January 2009. There are three ways to defend against the weevil: (1) Cut down and destroy the infected trees. That must be done carefully so as not to spread the insect. (You can't just chop down an infected tree and casually drag it off, for example, because the insects can spread to uninfected trees in the process); (2) Wage chemical warfare using the appropriate insecticide. Obviously, spraying presents environmental problems in populated areas. Trunk injection of individual trees is a better way, although slower. Also, artificial pheromone traps are a chemical alternative to insecticide; (3) Keep trees from being infected in the first place. 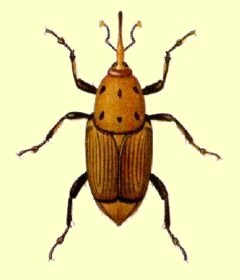 (The weevil prefers to lay its eggs in softer tissues, and, thus, is less likely to attack a sturdy healthy tree than a tree in poor shape, say, with patches of bark missing or one that has been mechanically damaged in some way.) The alternative, if the battle is lost, is to replace the palm species with another variety of tree. There are species of palm (for example, the Chamaerops humilis, also known as the Mediterranean Fan Palm) that are immune to the red palm weevil, but they might not fit the aesthetic or shade requirements of the city. Some replacement has already begun with non-palms; that is, in the item alluded to in the first paragraph, a camphor laurel tree, will replace the palm that was at Piazza Vanvitelli. I voted for the winner, but somehow I am not consoled.